Businesses are living in an era of wealth, liquidity and mobility. Amazon blew past $1 trillion in market value in September 2018. Walmart picked up brands Bare Necessities, Art.com, and Eloquii, before recently acquiring Aspectiva, and AI-led product comparison and review tool. Netflix recently surpassed Disney in value. Procter & Gamble expanded its reach by swooping up a number of small healthcare and personal care brands like L., Form and Bevel from Walker & Company Brands, and First Aid Beauty. They save people time effectively adding hours to our days otherwise spent in search of commodities or entertainment – this ultimately delivers convenience. This blending of content and commerce to provide for both experience and consumerism is not unique to any of these large brands – though they arguably do it the best. In fact, traditional and digital native vertical brands across the globe are working fast to implement similar strategies. Agencies are not far behind, picking up the pace with which their technology offerings operate — as well as tailoring new go-to-market strategies to encompass this new approach. Headless commerce is one such example strategy, an experience-led ecommerce system or model. Headless commerce architecture describes the decoupling of the presentation layer of a website and ecommerce functionality. Developers can utilize their content management software (CMS) or digital experience platform (DXP) of choice to deliver high-quality content experiences, and plug in an ecommerce solution on the backend that manages all commerce functionality. Ecommerce platforms in this model serve up PCI compliance, security, fraud management and inventory management that can also connect to larger, key infrastructure points such as ERPs, PIMs, OMS and POS. For agencies, this opens up a world of possibility from a client acquisition standpoint, as well as a way to offer more digital ecommerce options. Brands who live on WordPress and other CMS platforms no longer need to re-platform to get ecommerce added into their digital experience — which saves time, money, and headache. From an agency offering standpoint, it’s easy to see how headless commerce can provide more options when it comes to ecommerce platforms. For content-focused brands like lifestyle products, direct to consumer (DTC) brands, and brands relying heavily on influencer and native advertising, a content-lead strategy like headless commerce is often a no-brainer. 1. Amazon is the commodity market. Meaning if brands sell their products there, they are competing for mindshare, especially from Amazon itself, and are subject to immense pricing pressures within the context of the most respected brands in the world. In recent months, Amazon has proven that it is planning on pushing more and more native products onto their platform, potentially shutting out third-party brands, especially those who do not use Amazon fulfillment services. But more than 50% of Americans begin their product search on Amazon, so it’s wise to think of Amazon as a sales channel rather than a competitor — at least while you’re helping a merchant build out an omnichannel strategy. Still, though it produces short-term profit, it eats into long-term return – and that’s not accounting for any future Amazon initiatives that eat into additional markets. Amazon is not the be-all, end-all; nor should it be seen as the first channel to use in a brand’s go-to-market strategy. Instead, look for an approach that solidifies a brand’s presence and voice — while also offering steady ecommerce system functionality and easy checkout. 2. Traditional retailers are quickly going direct-to-consumer. Big box stores are realizing they have lost community, and thus brand recognition, due to the thousands of digital native brands (DNVBs) that have focused solely on establishing a lasting connection with consumers. But shifting to direct-to-consumer from a b2b wholesale model isn’t easy. Tech debt from historic open source or custom-built ecommerce technology solutions slows down internal decision making and threatens internal innovation and testing. This is where a lot of agency expertise comes in. While it’s a hefty undertaking to move a traditional retailer into the lean, streamlined digital ecommerce space, it’s a technique that many agencies have mastered by working largely with brands in that vertical to begin with. 3. Digital native brands number in the tens of thousands. This is in part thanks to SaaS ecommerce technology, which allows brands to rapidly build modern ecommerce websites affordably. Without the size to go after wholesale markets, these nimble brands have built grassroots communities, conquered social media advertising, and are making true waves in digital native advertising — that is, advertising that you don’t even know is advertising. While digital native brands often lack the marketing budgets of the mid-market or enterprise brands they hope to displace, they are highly effective marketing and community building machine. Digital native brands are also often the first to use high-powered and tech-savvy agencies to help build out the brand voice, front-end experience, and digital presence. These brands are causing much larger competitors to respond either through acquisition (like our Walmart and Procter & Gamble examples) — or head-to-head competition. This is where ecommerce first started, back in the days when hardware and software were inextricably linked. For instance, if you buy IBM hardware you must then, therefore, use IBM software. The industry has largely since evolved from this model. This strategy uses a commerce platform front-end for UX and checkout, but APIs for data orchestration across a more robust infrastructure. Businesses using this model often implement a PIM, ERP and OMS for product information management, accounting and customer integration and inventory management across channels. Businesses using this model are typically using SaaS or open source technologies. This strategy decouples the presentation layer from the ecommerce platform using popular CMS solutions like WordPress for unparalleled content experiences that increase brand value perception and drive to checkout. In this model, the ecommerce platform provides PCI compliance and inventory management – though can be connected to additional systems like ERPs, PIMs, or OMS tools via APIs. What is the impetus behind a move to new ecommerce models? With 55% of product searches happening on Amazon, brands cannot afford to not be there. But Amazon is a commodity market. Therefore, brands are looking for ways to turn their sites into value destinations driven by community, content and brand experiences. The most traditional ecommerce model is the monolithic model. Many brands still use a monolithic strategy, and many agencies still recommend a monolithic strategy for enterprise and well-established brands. The downsides to a monolithic strategy are slow go-to-market timelines and high development costs. This delays innovation. Upsides to a monolithic model are full platform control for the IT department — which may come in handy if an ecommerce strategy or site experience needs extreme customization. Commerce-led or commerce-first models use APIs for data orchestration and give relative control to IT teams for infrastructure connectivity. On a SaaS platform, the number of API calls available is important to making sure this functions properly. High or unlimited API call volumes. A heavy focus on API development in product roadmap make. This is what an open SaaS architecture looks like. Headless commerce takes open SaaS one step further, completely decoupling the presentation layer of the ecommerce platform. API connectivity and robustness is important in ensuring data orchestration across the decoupled systems. This is what the headless commerce model looks like. Why headless, and why now? There are multiple benefits to using both commerce-led or a content-led ecommerce strategy. Site customization and personalization options. Flexibility, familiarity and fund-savings for developers. Marketing effectiveness for innovation without hurting backend processes. Speed to market for international and omnichannel GTMs. As an agency, offering a headless approach allows you to implement ecommerce with brands that are already using a CMS platform, without making them do a full re-platform — thus maintaining their important content-first strategy. Additionally, headless commerce opens up a world of possibilities with brands that are looking for a content-led strategy to begin with. There are now truly no limitations to the customizations that can occur in the digital ecommerce space. 1. More customization and personalization. Brands looking to drive increased engagement on their sites through content experiences are often best serviced by a headless commerce platform and approach. This gives you the flexibility of a CMS like WordPress or Drupal with the security of an ecommerce platform like BigCommerce, which manages PCI compliance and checkout uptime, among other aspects. If your agency specializes in unique branding or web experiences, now’s the time to hop in and plug your services into the ecommerce world. 2. Increased flexibility, familiarity and fund-savings for developers. Facebook.com and WordPress sites attract roughly the same number of monthly unique visitors, but Facebook does it with 25X the employee count. WordPress employs less than 400 people. All the rest of the work being done for sites using WordPress is accomplished via agency or freelance front-end developers and designers. And with nearly 30% of the modern web using WordPress, some studies suggest that upward of 25% of freelance developers make their entire salary off of WordPress development. Indeed, you can throw a stone in any direction in most cities in the U.S. and have it land within a few feet of a WordPress developer. That is how ubiquitous WordPress development is. To save time in finding a developer and on costs is having a developer work in a system in which they aren’t familiar (some ecommerce platforms use proprietary coding language, for instance), going the headless route can lower the total cost of entrance or launch. With developer cost savings, your clients will have more budget free to spend on your agency’s value-add services. 3. Marketing effectiveness for innovation. The keys to growing ecommerce revenue month-over-month is innovation at speed and at cost. Agencies and ecommerce marketing teams need to be able to get programs and campaigns up quickly, A/B test them and then double down on what is working and get rid of what isn’t. A headless commerce platform approach can make this easy for everyone. Working within a familiar CMS speeds up productivity, while maintaining the security, inventory syncing and data orchestration needed for the larger organization. 4. Speed to market in new geographies or channels. Combine all of the advantages above and now apply them to the process of launching in new geographies or launching micro-brands. Once you have the system setup, a headless solution is easily replicable across the board, optimized for international SEO and connected to the overall data orchestration infrastructure. There are a variety of content management software solutions in the market — chances are, as an agency, you’ve worked with each of them at least once. Whether your clients prefer WordPress or Drupal, want to upgrade to BloomReach or have their own custom-built solution – headless commerce still works in just about any use case. All you need is an API connection to decouple the BigCommerce presentation layer and then plug the platform in to where you need it to work. PCI Compliance mitigation: Less work for IT teams, as the SaaS provider takes on the risk. Checkout security and fraud protection: Same as above. Less work for IT teams as the SaaS provider takes on the risk. Open architecture & extensibility: Utilize pre-built integrations with ERPs, CRMs and more, or custom build your own with additional APIs and SDKs. Here are a few of the more popular CMS solutions used in a headless commerce implementation. WordPress is the CMS of choice for more than 30 million websites around the globe. As such, it is the leading CMS on market. Brands from the start-up next door to The New York Times use WordPress to run their businesses. Historically, combining ecommerce with the power that is WordPress’s content solution has been difficult. WooCommerce was for a long time the only serious player in that market. However, WooCommerce’s drag on site speed as well as high-cost for security and implementation (WooCommerce is an open source solution) have pushed would-be users to lower-cost SaaS ecommerce platforms. Those ecommerce platforms, however, have historically had a poor content management system (CMS). After all, it isn’t what they were built for. With BigCommerce’s recent launch of the BigCommerce for WordPress plugin, there is a now a scalable, SaaS solution available for the WordPress brand. BigCommerce also partners with WPEngine and Nexcess for unparalleled WordPress hosting support. “Razoyo is excited to be involved with BC partnership from several aspects. We believe the future of headless commerce rests in the ability to marry an easy to use CMS system with best in class e-commerce capabilities. Drupal is considered the leading enterprise CMS solution. One of the main reasons why Drupal is preferred by enterprise organization is its security. Drupal is the preferred CMS for governmental agencies and website like whitehouse.gov because of the high level of security. In addition, Drupal is designed for custom development. Whereas in the WordPress community, folks like to use plugins (hence the BigCommerce for WordPress plugin), folks in the Drupal community like to custom build. As a result of custom build versus plugins, Drupal often doesn’t have the same site load lag times as WordPress – and it can handle a much larger volume of content. Other than that, some designers, developers and editors just plain prefer Drupal over WordPress. BigCommerce partners with hosting providers Acquia and Pantheon to deliver a world-class headless commerce experience on Drupal. “The WordPress and Acquia integrations with BigCommerce certainly stand out for marketers. As decoupled and headless commerce solutions become increasingly popular for marketers to deliver dynamic content across many devices, the demand for a rock solid back-end platform capable of supporting a larger number of API calls becomes even greater. BloomReach is a digital experience platform. Large, enterprise retailers are a perfect fit for this headless ecommerce CMS solution. BloomReach offers a microservice / headless architecture and APIs to reduce IT complexity in powering an optimal customer experience from homepage to checkout. If you are running a complete omnichannel business, BloomReach’s microservice architecture and partnership with BigCommerce for a headless commerce solution is worth taking a look at. Adobe Experience Manager (AEM) brings together a content management system (CMS) and digital asset management (DAM) in a single place. It’s a comprehensive solution for building websites, mobile apps, and forms, directly alongside marketing content and assets. It has native connections to Adobe Creative Cloud, making it easier to get content to market faster and create the personalized experiences. Content Management System (CMS): Make sure your content is consistent and personalized for each customer with Adobe Experience Manager Sites. Create and manage your digital experience across all channels with automated tools that make scaling effortless. Digital Asset Management (DAM): Spend more time on experiences and less time searching for and adapting content. Adobe Experience Manager Assets gives you automation and smart tools to rapidly source, adapt, and deliver your assets across audiences and channels. Digital Enrollment and Forms: Stop integrating point solutions. Adobe Experience Manager Forms is an end-to-end solution that connects your forms and communications processes, so you can give your customers a seamless journey from acquisition through retention. Managed Services: Alleviate your IT team’s workload and get to market faster with Adobe Managed Services. Our cloud services, best-in-class tools, and Adobe expertise guarantee scalable and secure applications while helping you boost innovation and increase ROI. Create faster with native Creative Cloud connection: Make it easier for creatives to create, marketers to approve and publish, and both teams to work together better. Do more with smarter digital asset management: Save time by editing, optimizing, and delivering them, too — all from one platform. Eliminate tedious tasks with asset automation: Use AI to automate tagging, cropping, workflows, and distribution — doing in minutes what used to take hours. Engage more customers with rich media delivery: AEM’s AI and machine learning brings hidden opportunities and answers to everyone with the click of a button. Build Lifetime Value: Deliver digital experiences over the lifetime of your customer that build brand loyalty and drive demand. Be Consistent Across Channels: Deliver amazing content across websites and mobile, to in-store and beacons. Get Timely and Personal: Deliver and manage experiences that are responsive, relevant and social. Place the customer at the center. Product Sync: Synchronize products and metadata from BigCommerce to AEM. Augment and manage product data post sync directly within AEM. Users: Synchronize user data from BigCommerce to AEM. Webhooks: BC4AEM uses BC webhooks to get product updates in real time. Cached Commerce: The connected BigCommerce store will sync at a merchant determined intervals, saving a cached version of the catalog inside AEM instead of constantly hitting the BigCommerce API for product information. PCI Compliant Checkout: The checkout is iFramed into AEM (no subdomain redirects or loss of session tracking) and maintained by BigCommerce, giving the merchant a secure, PCI Compliant checkout experience, lessening risk overall. No Backend Bloat: BigCommerce for AEM removes the need for the CMS or DXP to power the commerce related activities and instead, it uses the our engine to power all things commerce. Integrate Commerce + Experience: Build immersive sites with the Adobe Creative Suite, building on top of BigCommerce product and user data to deliver tailored experiences. Page & Category Creation: BC4AEM populates Product Category Pages (PCPs) and Product Detail Pages (PDPs) upon syncing BigCommerce to AEM, helping reduce time to market. Built for Business Users & Marketing Teams: Business users can sync and manage product data within AEM, allowing marketing teams the ability to further augment as needed in AEM. Reduced Burden of PCI Compliance: Enhanced ecommerce security and peace of mind. Increase conversion and security with BigCommerce’s fully-embedded checkout. Deliver the fast, responsive checkout shoppers expect, while reducing the burden of PCI compliance. Working with a client that has a custom CMS solution? No problem. Custom content management systems can use BigCommerce’s APIs to decouple the BigCommerce presentation layer, plugging in the back-end system to maintain PCI compliance, checkout security and fraud management – along with inventory management and integration to ERPs, CRMs and more. First of all, it’s often very difficult to tell if a brand is using headless commerce as a strategy just by looking at it. This will only become more so true as headless ecommerce becomes more mainstream and loses its URL redirect to a checkout page. For the time being, let’s look at a few headless commerce examples. Kodak uses WordPress on the front-end to host their products, blog content and merchandising. For checkout, they outsource PCI compliance, checkout uptime and security to BigCommerce. This also allows them to use integrated payment options like Amazon Pay, PayPal One Touch, Apple Pay and more without having to do the interaction work themselves. This saves time, saves money, increases security and allows for fast innovation and campaign launch to remain competitive in the industry. 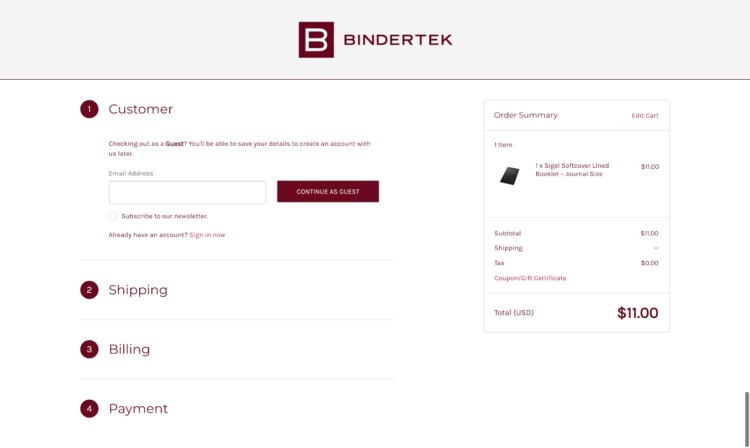 Hosted on WordPress with ecommerce functionality from BigCommerce, the Bindertek website uses a 1-page checkout to get users quickly into and out of the buying funnel. Carluccio’s built this presentation layer (i.e. the site experience) on WordPress, then used the BigCommerce for WordPress plugin to implement a headless commerce solution. This allows a customer to stay on the same site (no subdomain) throughout the experience. Here is how it works. Watch that URL. With a front-end built on the Sitecore CMS, Duxiana maintains the rich and detailed imagery that helps illustrate the benefits and features of their products — while also having powerful and secure ecommerce on the back-end for the purchasing process. Duxiana mattresses have a lot of customizable features, so it was important that they maintained a management system that solved for all of the different variants that the product may have. Editor’s Note: Section written by Travis Balinas, Sr. Product Manager, BigCommerce. Years ago, BigCommerce was built from scratch. We had to define how things function on the front-end based on inputs from the backend. For example, we built the concept of a product catalog on the backend, including title, images, reviews, warranty info, and more. We’ve also built out how those backend inputs translate into the structure of a product page on the core BigCommerce platform. So when you visit a page to shop, the images you see are displayed there by choice. The font size, placement of the title, the product details, etc. all had to be determined. This is what we call Stencil — our version of a front-end CMS, if you will. When you add a theme into the mix, the theme is still using the same Stencil foundation, but getting more particular in terms of how the layout should change, what style customizations need to be applied, what product information needs to be present (or removed), and more. With headless ecommerce, while core elements of the BigCommerce backend can live and breathe outside our SaaS platform within another system, there’s no structure in place in those other systems — similar to how we treat Stencil. What that would look like. A good example of this would be something like furniture inside a house. My house is fully furnished and the furniture in each room was selected for a reason. The layout of the furniture was determined by me based on usability, function, and parameters of the room. Even the concept of having rooms is something that is unique. If I were to hire movers and take all the furniture from my house and put it into a different house that has zero rooms, just raw open space, and without instruction, it would just be nonsensical and not at all functional. The same thing happens with headless commerce. In this example, furniture is the product catalog, movers are the API, and the rooms are the various pages that we’ve built inside BigCommerce (i.e. product page, cart, checkout, account information, etc). Sure, you can hire movers and they’ll get the furniture moved, but if it’s done at random with no organization, nothing will be accomplished. With our BigCommerce for WordPress initiative, we built an external-to-BigCommerce framework that gives order to chaos. Knows where that “furniture” is supposed to go. This template for commerce we built is what we’re calling our reference implementation. It’s worth calling out that not every piece of “furniture” might be needed in the new house. Maybe you’re moving into a smaller place and you just need the bare essentials. For example, a non-indexed microsite that you simply want to act as a landing page of sorts, like a soda company wanting to test out a new flavor. All they would need would be product details and the ability to serve up a checkout experience. Maybe you’re moving into a much bigger place that already has furniture and you need to make sure your furniture works with and integrates nicely in the new environment. The beauty of the approach we took with BigCommerce for WordPress is one that can be applied to a variety of other systems (different CMS, DXP, and other platforms). This reference implementation then becomes the basis for others to use as a guide for how to build BigCommerce into a different system. We made significant changes to the BigCommerce platform to enable all of this. We now treat individual “heads” as unique channels. Previously, our concept of channels was limited to marketplaces and several POS systems. Now, BigCommerce customers can treat channels as any place where they wish to be selling. So you can now build a mobile app and embed our checkout in it. You could take our APIs and create product overlays in proprietary video software. You can connect the catalog to 30 different WordPress sites and still be running a BigCommerce Stencil B2B site as well. This is how you achieve true omnichannel commerce. It’s decision time for your brand or your agency’s clients. Time to decide whether they’re going to use an old self-hosted platform and business model that holds them back, or make a game-changing decision to use cloud and SaaS to take their business into the future. For brands, Amazon’s commodity market is profitable, but earns little brand equity. And micro-brands numbering in the thousands are chipping away at THAT brand recognition and loyalty – with much smaller teams and much smaller budgets. These merchants getting squeezed in the middle – and there’s only one way to stop it: innovate at speed and cost. If they don’t, the company won’t be around in five years. They simply won’t be able to compete. I know that because I’ve seen a lot of changes to the world of ecommerce since I started working in the industry over 15 years ago. Back then, nearly all of the ecommerce sites I built were bespoke, self-hosted solutions. I worked for a Magento Gold Partner agency for almost 5 years, and during that time I saw the many limitations and challenges of self-hosted ecommerce platforms. Although they were designed with flexibility in mind, many necessary functions like integrating other systems or securing development talent at any kind of reasonable cost were massive money and time debt centers. The plain truth of it was that self-hosted platforms like Magento were very complex to work with and took a long time to go to market. But, they were the only options available. That’s no longer the case. When I worked agency side, we started building ecommerce sites on SaaS platforms like BigCommerce. I quickly saw that working on SaaS ecommerce platforms was so much easier than working with self-hosted platforms, especially at the enterprise level with integrated systems. The SaaS benefits are easy to see: it is so much less expensive, doesn’t require an army of specialized developers, and companies can go to market much faster. This is how those micro-brands outcompete you with less resources and capital. And you can fight back. Traditional retailers are starting to realize the benefits software as a service, and of making the move to SaaS. In fact, I witnessed a large migration to SaaS across the entire commerce and business technology stack, not just the ecommerce platform itself. However, large organizations don’t always move as quickly as they should — even when it’s in their best interests. Fear and technology investment debt are holding traditional retailers back, allowing Amazon (and other marketplaces) to strike from the top and micro-brands to attack in the thousands from below. Death by a thousand cuts if you will. The black swan for your business isn’t a disrupting startup. It’s a line item on your P&L. I started recommending SaaS ecommerce platforms to my customers, but many initially pushed back and were hesitant to make the move. Although they wouldn’t say it directly, I think the fear of the unknown kept them from making the logical move to SaaS. When you have a legacy with any self-hosted technology, you’re loathe to throw out those investments. You’ve made massive investments in people, processes, and technology to get up to speed on your self-hosted platform, and you feel like all of that will have been a waste if you go to SaaS. When you’ve invested heavily in people with back-end development skills, you’re worried about what all those developers are going to work on if you move to a SaaS platform. Making the decision to move away from traditional on-premise software that is in its little silo of ownership and management within the business can be extremely difficult. It threatens your position of knowledge, of authority, of power, of control. It may even threaten your livelihood and potentially your career if you get it wrong. In short, it all comes down to the fear factor. Take too much time and planning. But in my experience, when it comes to business, what change really takes is leadership and vision more than anything else. Digital is driving your businesses to change whether you like it or not. It behooves you to work with vendors, partners, and consultants who have a track record of success. Partnering with the right people that can give you the confidence you need to move forward is critical for making the move to SaaS. The need for speed-to-market in terms of the initial build, integrations, and deployment of the stack is important for this switch, but it’s also the need for speed in the evolution of the user experience for your customer. On self-hosted platforms, change is more painful. The simple truth is that self-hosted technologies are not designed for the pace of change of business today. With self-hosted technology, you can literally spend months configuring, testing, and load-testing the infrastructure behind the technology as opposed to actually being in market making money. Again, the SaaS benefits here at clear: you can be in market within weeks, avoid all of the development hassles, dramatically lower your costs, and not have to worry about security since SaaS ecommerce companies handle PCI compliance. Three of the most disruptive factors that I’ve seen in my 15 years in digital are mobile, SaaS, and APIs. These three disruptors are closely related in many respects, but API-led connectivity, an API-led technology, an API-led organization, an API-led economy is the future. This is yet another benefit of the SaaS model: the API-led approach sets them up perfectly for the future of commerce where best-of-breed technologies can be easily added as custom integrations. Self-hosted platforms are going to be left behind. Many trends are taking shape in ecommerce, but maybe none more prevalent than voice commerce. It’s already more disruptive than most businesses can appreciate. In fact, voice is changing online shopping as we know it. While the vast majority of ecommerce businesses still rely on organic, paid, and email channels to drive traffic, we’re moving to a voice-driven world where this model becomes totally challenging — especially if you aren’t an omnichannel business. Google says it has sold a Google Home device every second since October 19, 2017. Amazon announced in January that over 100 million Alexa items have been sold. Voice commerce is going to be the biggest game changer we’ve seen in commerce in probably a decade. Google recently implemented Shopping Actions, which effectively turns them into an Amazon-like marketplace except that they’re not selling against their merchants. And the transaction is going to be taking place directly within Google. Merchant partners of Google that are already selling via Google Shopping, which redirects back to the merchant, is going to be a thing of the past. Google wants to be able to clip the ticket across every stage of the transaction — from the marketing to the payment to the fulfillment. This is Google’s answer to a voice world and it’s going to integrate tightly with Google Home and Google Assistant. It’s probably the biggest change to Google’s fundamental architecture that we’ve seen since there was a Google. Leading SaaS ecommerce platforms are developing AI integrations to be on the vanguard of voice search technology and to give you the features you need to satisfy customers. As we continue to move into a relationship marketing model that’s informed by content, blended with commerce, and based on experience, you have to be extremely agile and highly adaptable to thrive in our ever-changing marketplace. After all, the only constant is change, and you’re going to have to get really comfortable with it because it’s coming whether you like it or not. SaaS ecommerce solutions are, by far, the best platforms for enabling you to quickly adapt to change while achieving a lower total cost of ownership, a faster time to market, greater security, and everything you need to deliver a world-class online shopping experience.